We have seen that the cosmological microwave radiation is exceedingly homogeneous, in 1 part for 100,000. Why ? Of course, nothing forbids this uniformity of the cosmos, but to say that it is about a coincidence, it is maybe to pass next to an essential point. In order to get a better understanding, we must begin by defining the notion of causality. Physics is always based upon the notion of causality : a cause always precedes the effect. What's more, according to the theory of relativity, the information cannot move faster than light. Hence, you cannot detect an effect before a time at best equal to the necessary time for light to travel from the cause. From this point, we can define the "sphere of causality" of an event : it is the set of places which, at a definite moment, can perceive the event. Naturally, this sphere is growing with time at the speed of light. 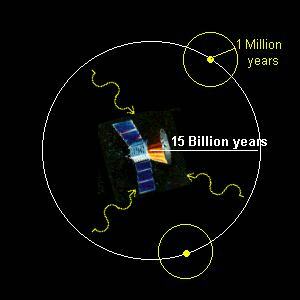 When the fossil radiation was emitted, the universe was one million years old : so, the sphere of causality of the particles which emitted this radiation was one million light years wide. COBE, in the center, is looking at the fossil radiation which has travelled for 14 billions light years. Each emitting particle has a sphere of causality which is only 1 million light years wide. So, how can they all be at the same temperature ? The individual spheres of causality don't overlap. In these conditions, we must deduce that atoms outside of their individual sphere of causality were at the same temperature. What is at least curious. This effect is known as the problem of the horizon, where the horizon is the furthest observable distance. All the matter which is fills the observable universe today occupied, during the Planck's time, a greater volume than the horizon at this moment. And yet, the temperature of the universe is homogeneous (on a large scale). To explain this fact, the American physicist Alan Guth suggested the hypothesis of inflation. We saw that the separation of the forces during the early times of the universe was comparable to a -change of phase, in the same way as the water which becomes ice. But, even when the temperature is lower than 0°C, water can exist for short times. This phenomenon is called superfusion. When the temperature of the water comes down, this one can remain liquid below 0°C. MBut there will come a time where it will freeze, and at this moment, the temperature of the whole water will rise to reach the 0°C of the transition of phase. The same phenomenon appears at the time of the differentiation of the forces. The forces can remain unified even when the temperature has gone lower than the temperature of separation. At this moment, the energy of the scalar field associated to the unification of the forces becomes greater than the temperature of the universe. This field becomes equivalent to a repulsive force, which will make the universe to inflate in a huge proportion : at the time of the breaking of great symmetry, around 1028 K, the radius of the universe increases 1050 times. As the change of phase takes place, after the superfusion, the scalar field suddenly disappear, because it represents the unification of the forces. Its energy is transformed into an expansion of the universe. and a last time around 1012 K, when quarks are becoming confined, and hadrons begin to appear. The effects of this last transition can be seen as negligible. What are the effects of this sudden increase of size of the universe? First of all, this inflation allows us to solve the problem of the horizon that we have previously seen : indeed, all the distances are exceedingly increased in a very short time. The spheres of causality of the various points which are emitting the fossil radiation can have previously overlapped, and hence explain the homogeneity of this radiation. The whole points of the universe are causally dependent, and can have the same characteristics. The speed of the increase of size of the universe was far greater than the speed of light : this does not violate the theory of relativity, because no information was moved during the inflation, only a geometrical property. The second effect of the inflation is the flatness of the universe. Indeed, this inflation increases all the distances in the universe, including its radius of curvature, which tends towards infinity. In a classical scenario, the universe must begin flat in order to remain so. With the inflation, whatever is the curvature of the universe at the beginning, it ends flat. The third effect of the inflation is the dilution of the elements of the universe. By increasing its size, the density of various "exotic" objects, like primordial black holes or magnetic monopoles, decreases. These elements are foreseen by the theory, but they have never been discovered. How can we validate this hypothesis ? The theory shows that the explosive expansion of the universe during the inflation period should have created gravitational waves, and for lack of being able to measure them directly (at least for the moment), we could reveal them through their interaction with the microwave cosmic background. By creating ripples in the space-time fabric, these waves are inducing a particular polarization of the microwave background, of a quadrupolar type, named B-mode. The colors show the temperature of the CMB, the vectors, its polarization. The observed designs, spiraling around hot and cold points, are typical of the B-mode polarization. It is this kind of polarization which has been measured at the South Pole BICEP2 observatory, driven by the National Science Foundation. Such a measurement gives us a real validation for the hypothesis of the inflation. 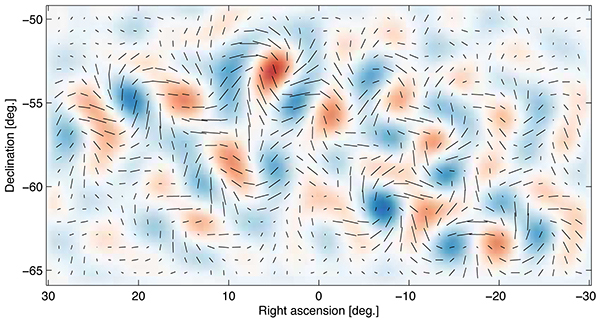 We can also notice that this is the first observation of a quantum gravity effect.